Well, I can finally say that I’m in no-man’s land as far as these films are concerned. 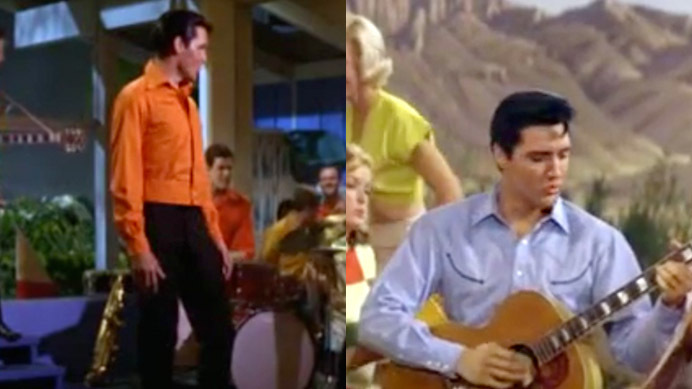 With The British Invasion in full swing and the quality of these films going down, down, down, Elvis was starting to lose his patience, and it shows. In fact, he hated the music he was forced to record for Girl Happy so much he refused to record any new songs for several months after—and I can’t say I blame him. As a result, all of the songs in Tickle Me are just recycled from previous recordings. As for me, well, I’ve now watched eighteen Elvis films—that’s more than halfway through—and I’m finally starting to feel some fatigue. On one hand, I’m really enjoying how much Elvis knowledge I’ve acquired—I find myself being able to have conversations with people I know in which I drop a ton of Elvis facts with ease and confidence, and being able to watch them respond in turn with polite nods and glances at their watches. Well, after these next two films, I too was looking at my watch. The year is 1965, and as dopey as I thought Help! was, these next two make it look like a lost Spielberg epic.